Two full feature bread machines with automatic fruit and nut dispensers and some unique options. The Delonghi DBM450 and Breville BBM00XL bread machines offer a wide range of features and are both premium priced. Owners are generally satisfied with both machines. In addition to automatic fruit and nut dispensers, both offer collapsible paddles to reduce the size of the while often left in the bottom of the loaf. They are both single paddle machines and bake vertical loaves. Both offer numerous settings and customizable setting options to varying degrees. 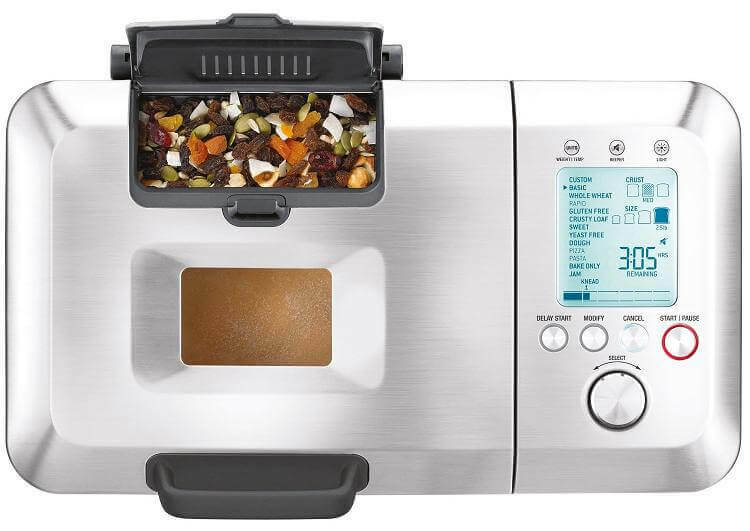 The DeLonghi Bread Maker offers a significant set of features including a hopper that allows you to add fruit or nuts at the appropriate time and 15 custom settings. It also has a very large viewing window in the top and an internal light to allow you to check progress during the baking process. It also features a convection option that circulates the air to create a crispy crust and reduces the moisture that sometimes weighs-down a loaf. 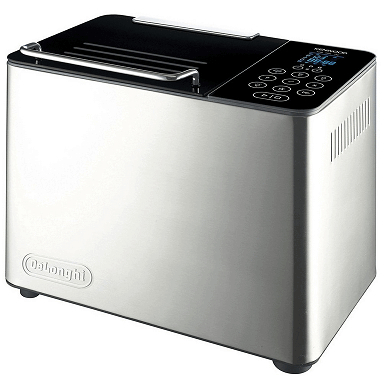 The DeLonghi Bread Maker weighs around 19 pounds and measures 17.3 by 18.2 by 12.4 inches (H x W x D). 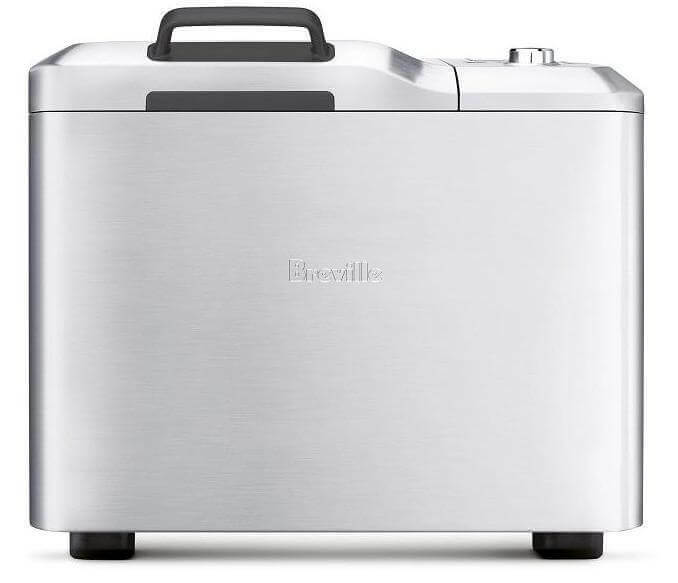 The Breville BBM800XL Custom Loaf Bread Maker is a fully-featured bread machine that features an automatic fruit and nut dispenser, an intuitive control panel with an extensive set of settings, a large loaf option from 1 pound up to 2-1/2 pounds, customizable settings, 100% whole wheat and gluten free capability, a viewing window and a collapsible paddle that is designed to minimize the size of the hole in the bottom of a baked loaf. It can also prepare jams, jellies and sauces and features a non-stick, Teflon pan. It is available in a stainless steel finish and weighs about 17 pounds. While the collapsible paddle concept is designed to decrease the size of the hole left in the bottom of the loaf, there were complaints about the Breville machine failing to collapse the paddle which actually resulted in a large hole in the bottom of the loaf than what would have been left by a fixed paddle. There were no complaints about the collapsible paddle on the Delonghi. Other bread machines have generated complaints about the instruction book and Delonghi seems to share the same complaint. One of the complaints is that the ingredient proportions are measured in weights such as grams rather than cups or spoons. This requires the purchase of a baking scale because none of the measures are translated into relative cup or spoon sizes. We published an article on this site that shows you how to convert measures, but if you are used to measuring with cup and spoon sizes the instruction book can be a challenge. There were also some complaints about understanding the 15 Delonghi settings. A small instruction book is clipped to the side of the machine, but if you lose the book you will have a difficult time determining appropriate settings. Conversely, the Breville had high marks for its easy to use and intuitive control panel, so if ease of use in terms of settings is important to you, the Breville seems to offer the easiest interface and controls. There are two unique design features on the Delonghi. One is a lighted viewing window. This is the only bread machine we’ve reviewed to have this feature and it does make it easier to observe the progress of any loaf or other recipe. A second unique feature on the Delonghi is a convection option that provides for even browning of the crust. There were some complaints about the size of the Breville fruit and nut hopper. Some owners felt that it was too small for the larger 2.5 pound loaves. There were no complaints about the fruit and nut hopper on the Delonghi although its maximum loaf size is 2 pounds so it may be the 2.5 pound size on the Breville that’s motivating the complaints. Overall, both machines are generally liked by their owners. The only complaints seem to involve the collapsible paddle on the Breville, and the instruction book for the Delonghi. The machines appear to be dependable from a quality standpoint and both offer a 1-year limited warranty.